I believe your wedding perfume really is a decision that should be thought about. Obviously if there is only one perfume you wear then your choice has been made, but if you are not sure what you want to wear or are looking for a new perfume these might be worth a look (or smell). I absolutely love buying perfume, the beautiful packaging and pretty bottle always entice me in but ironically perfume is the one thing in my beauty routine I pretty much always forget to put on, especially during the day. I had been wanting this perfume for a while now so when I went on holiday I purchased it in duty free. This is a perfect perfume for day and night so it works well as a wedding perfume. This one is definitely more on the musky side then the other two but there is strong scent of oranges and strawberry's with a floral jasmine overtone. This one lasted the longest on me out of all three perfumes which I love. The packaging is beautiful as well, with its simple slim round glass bottle and metal flowers on the front it is easy to pop in your bag. A lot of photographers will take a picture of your wedding perfume so if it looks nice as well then thats a bonus. I treated myself to this perfume at the same time as the Valentino one, saving for a wedding doesn't seem to enter into my head when I'm in the perfume section of duty free. This perfume is very sweet and floral, the description of it states 'white water lillys' which I can definitely pick up on, this one is my favourite scent out of the three. I wore this one to my sisters wedding but I did feel like I had to respray a few times as I wasn't able to smell the perfume after an hour or so. I really love the packaging, it's top is nice and secure and the bottle is really sleek. I have had this perfume the longest, I am a big fan of Marc Jacob's perfumes. I do prefer this as a day time scent as it is a bit more fruity then the other two. I can definitely smell orange and berries. I like to guess what I can smell rather then read the description of the actual notes (notes is a technical perfume term I learnt two seconds ago). The description of this says it has coconut water which I cant smell at all. The packaging on Dot looks great but it is not practical at all, the lid is just too big to put in a bag. ScoreScent = 4 - Fruity and fun Staying Power = 4 - Just one extra application other than first putting it onPrice = 5 - The price of this one is what makes it so good, at only £35 for 50ml. For a perfume that lasts so long Total 13 out of 15Purchase Dot hereSo over all Dot by Marc Jacobs comes up trumps, I think I have a few more to sample before I make my ultimate decision, does anyone have any recommendations? 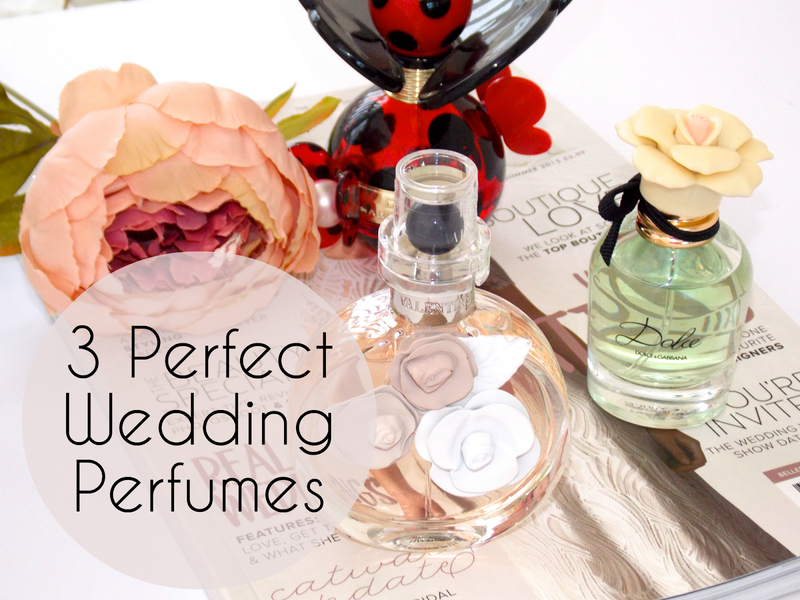 What perfume did you wear on your wedding day?. Let me know in the comments below.